There’s an interesting discussion about pay in the IFS Green Budget and the increase in highly skilled employment at the same time as a decrease in real wages. (See previous posts here, here and here.) 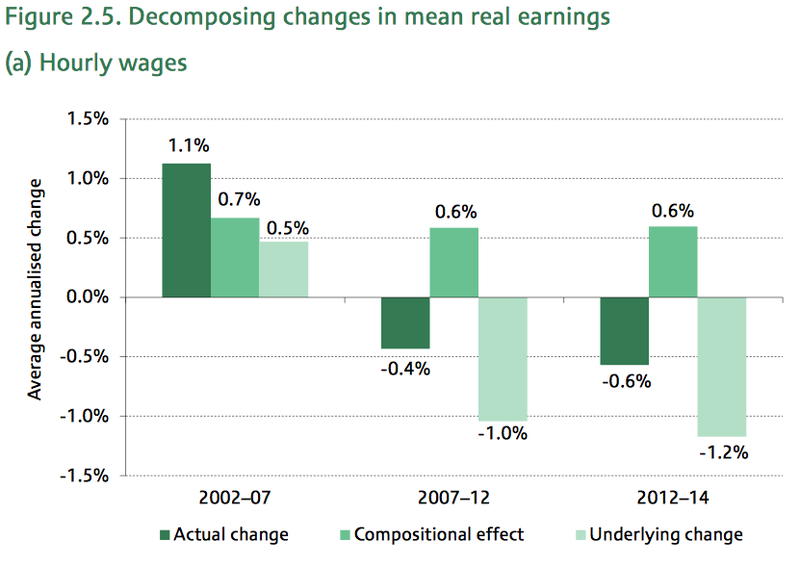 The IFS believes that the fall in wages has been mitigated by these compositional effects. Because the recent rise in employment has been among the higher-skill level groups, the fall in wages is not as severe as it might have been. Or, to put it another way, had the composition of the workforce stayed the same, the wage collapse would have been even worse. The overall conclusion that compositional effects are, on average, increasing real wages is also true in both the public and private sectors, and for both men and women. In summary, we can rule out a story that says that the continued weakness of earnings is due to compositional effects, such as lower-paid types of people returning to work after losing jobs during the recession. Cyclical compositional effects might be playing some role, but they are being dominated by the continuation of longer-run compositional changes, such as increasing education levels, that should act to raise pay. In other words, rising skill levels would normally be expected to raise pay. The fact that they haven’t is indicative of the severity of the pay squeeze. 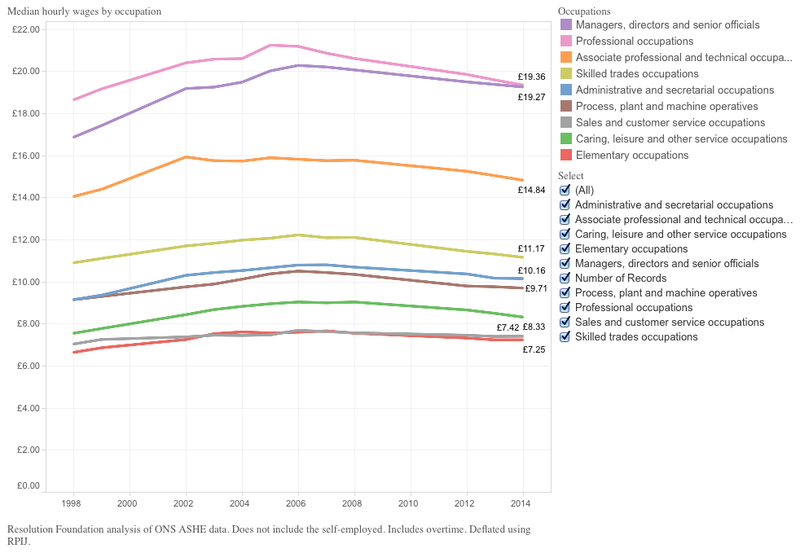 But, as the Resolution Foundation’s interactive chart shows, real-terms median pay levels for all occupational groups are now lower than they were in 2004. For all except the managerial group, they are lower than in 2002. For all groups, real-terms median pay levels started falling before the financial crisis. The recession has just made the fall that bit worse. The drop in pay is sharpest among the Professional and Skilled Trades groups, both falling by more than 6 percent in the decade since 2004. As Larry Elliott says, we have sacrificed pay for jobs. That seems to be true even for the highly skilled. Of course, all these figures would look even worse if we included the self-employed, whose earnings, on a number of measures, were on the slide before the recession and have collapsed since 2008. 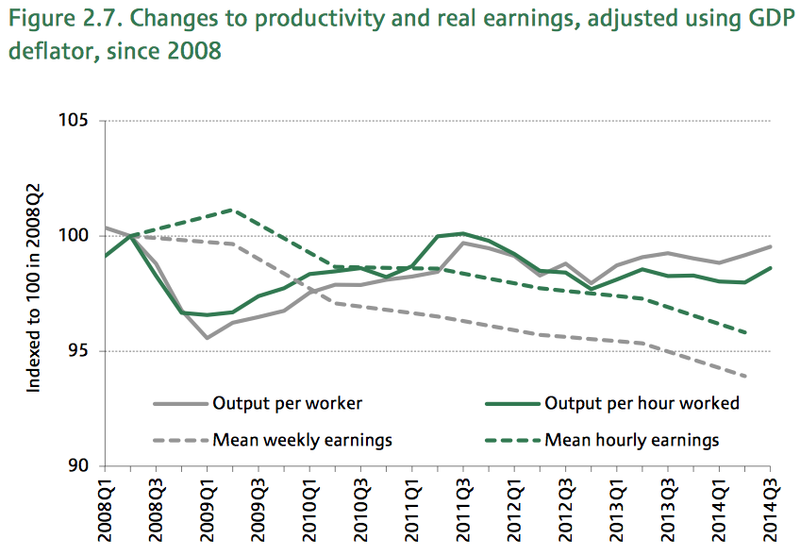 The IFS blames falling productivity for the pay squeeze, though it acknowledges that pay has fallen even faster than productivity. And, in any case, this just changes the question. Why has productivity collapsed? The pay puzzle becomes a productivity puzzle. 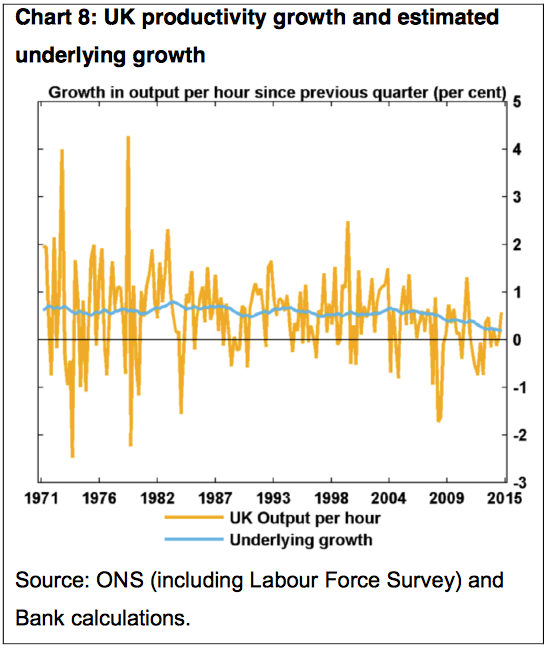 There’s a lengthy discussion of the productivity paper in this Bank of England paper by MPC member Martin Weale. He points out that the UK’s post-recession drop in productivity hasn’t been much worse than for of many other OECD members. That said, he’s not very optimistic about the near future. After the disappointments of the last few years one would be bold indeed to be confident that this is the start of a sustained revival. I have not been able to identify factors responsible for the weak productivity growth, except in the broad sense that it is related to the financial crisis and the experience of countries during the period 2008-2010, so I cannot be confident that shadow of this is now easing. Chart 8 suggests that the third quarter of this year is no more than a brief ray of sunshine in the gloom. The key to improving productivity is to improve skills say the CIPD, UKCES, the CBI and just about everyone else. But that’s where we came in. We have more people in skilled occupations yet still our pay levels and productivity have fallen. It could be that this is all simply the result of a catastrophic economic crash. Maybe it’s unreasonable to expect employment and pay to recover as quickly as they did after previous recessions. But the fact that these trends seem to have started before the downturn is worrying. Could it be a sign of a longer-term shift in the balance of power in the workplace? Are many employers substituting labour for capital and paying lower rates simply because they can? We have tended to assume that education, skills and qualifications gave workers bargaining power and therefore some protection from the pressure on wages and conditions experienced by the unskilled. It seems that is no longer the case. Middle-class professionals can have their pay rates hammered down too. If, as some commentators predict, technology enables even complex jobs to be chopped up into discrete tasks, things may be about to get that bit worse. We’re going to need a lot of growth of new industries to soak up what’s going to be a veritable tsunami of skilled and semi-skilled workers in the next 15 years. With predictions of driverless cars being ubiquitous by 2030, every taxi, train, van and lorry driver will be looking for fresh employment alongside thousands of warehouse and semi-skilled manufacturing personnel. Airline pilots will have long gone and even your local supermarket may have disappeared, with driverless home deliveries of food triggered from your internet-connected fridge arriving at a time to suit you in the evenings and weekends. The question is, what’s to be done with all these displaced workers? By definition, the type of job they used to do won’t exist, so presumably care work or other personal service type roles will be all that’s left. How much will education help them in those roles? History degree required to serve cups of tea to old ladies? Of course, the market always comes up with something new, and it’s to be hoped that’ll be the case this time around too. The fall in wages, lack of opportunity and even deflation look to be the new ‘normal’ otherwise, so we’d all better prepare for the change, just in case. Deficit reduction, anyone? Again Basic Income is the only solution. Also reduction of income taxes and increase of the wealth taxes. Certainly not a solution to a mostly non existent problem or anything else come to that . God save us from that lunacy . I guess you’ll be the arbiter of wealth of course . Below is a comment that I sent to the Guardian in response to an article on the basic income (see below). To me the question is whether the conditions/rights & responsibilities can be used to promote behaviour in the recipient that will improve their situation. This can then stop them being dependent on the basic income/better off – either floated off the basic income or at least earning more/acting in ways that their life is improved. In the UK’s welfare to work system this has proved successful since the original Beveridgean model began to be re-introduced with Restart in 1986. The most successful elements seem to be engaging the individual in what behaviours/steps are likely to improve their situation (e.g. through the Jobseeker’s Agreement in JSA) and then regularly checking that they are maintaining their behaviours and reviewing/changing them if they are unsuccessful. Problems arise if the conditions/rights & responsibilities are too onerous for the individual and force them off the basic income and so undermine the original intention of the basic income/benefit regime – to maintain a basic income of the individual. That is why one size fits all systems such as workfare do not ‘work’. With a universal Beveridgean welfare state the UK has a system which is already closer to a basic income than most other countries – particularly social insurance systems. What it does not have is an UNCONDITIONAL basic income system. The welfare state – particularly the benefit/pension system tends to require people to be in a certain situation – unemployed, lone parent, over 65 etc – and to require certain behaviours – jobsearch etc – to continue receiving the basic income. And, in general the requirements aimed to change the individual’s status – welfare to work etc – so they move out of the basic income system into the tax system. What confuses the situation is that the National Insurance system – which is essentially an income tax combined with a payroll tax – is laid on top of this system and half-heartedly moves people away from a residence based basic income system towards a social insurance system. It always bemuses me why the government is always banging on about creating new jobs but failing to up-skill unemployed Brits into these roles. Surely a functioning economy is one that can help to train up the lowest-skilled, lowest-paid workers into better jobs? That said, given the inflation figures today, one can hardly expect a pay rise any time this year… so maybe I should be down-skilling? I’m pretty good at wallpapering. The question is ‘what is productive work’. Could it be that the market is being diluted by grand-sounding but ultimately useless job titles. You might expect the hidden hand to ensure only productive workers get hired. But perhaps there is a tendency to hire ‘senior quality improvement advisers’ or ‘regulatory affairs consultants’. Roles that sound as if they do good things but deliver little. As with tax, productivity is for the little people. Your last para is esp. important. there’s a gradual shift from a simplistic focus on the supply side, towards looking more at how skills are actually utilised – especially women’s skills, as they now make up more than half the nation’s human capital. but a long way to go…. Despite the real wage falls in recent years the UK remains a very high wage country according to the OECD Taxing Wages database. Between 2000 and 2006 the UK was in the top 3 (of the 34 countries that the OECD considers) for labour costs, earnings and take home pay. Thereafter as real wages have fallen the UK has slipped down the rankins – 9th for average earnings (of a single worker in $US PPP); and because there has been big tax cuts in labour taxes in the UK 11th for labour costs; and 7th for take home pay. Despite this fall in the relative position the UK still had in 2013 the highest take home pay of the G7 and only Germany has higher earnings and labour costs. In addition, until the recent wage falls, the OECD identified (Employment Outtook 2004 and 2006) the UK as one of the very few countries that had not had a period of wage moveration over the 1990s and 2000s. It is perhaps for this reason combined with the very successful employment performance over this period that the labour share in the UK is amongst the highest in the developed world and also maintained its over the past couple of decades. In addition, inequality at the bottom end of the earnings, take home pay and income distribution has improved. I don’t see mention of lack of actual investment, spending on new capital equipment, more efficient processes and computer systems, brought up as a factor. Or is investment in productive stuff actually doing well? I don’t see how there can be a productivity collapse without a decrease in investment in improvements in efficiency. In fairness to the author, you can’t mention everything in one blog post. However, I think your instinct is right – the answer is that investment appears to have (like productivity) been declining before the downturn started.